SACRAMENTO, Calif. /California Newswire/ — Warning of the next inevitable recession and the “zigzag of spend-cut-spend” budgeting, Calif. Governor Edmund G. Brown Jr. today delivered his annual State of the State address, choosing to lay out a clear, focused case for his top priority – continued fiscal discipline – rather than “talk today about new programs” or restate every priority of the administration. The Governor vowed to “focus on how we pay for the commitments we have already made,” invest in “ways that will not lock in future spending” and keep California “prepared and vigilant” for a “profoundly uncertain” future. It was 41 years ago that I first spoke in this chamber. At that time, my father was rather surprised to see me make it to the governorship at such a young age. Now I’m kind of surprised that I am still here – and three more years to go. Back then, California was amazingly dynamic and it still is. We, who live here, love and know this land as a unique place which draws people from every part of the world because of the tolerance, the creativity and the sheer openness. There is much to be thankful for. And yet we live today in a world that is profoundly uncertain. What happens far away can touch us very directly. A slowdown in China or turmoil in Iraq or Syria or virtually anywhere can send the stock market reeling and put California jobs and state revenues in jeopardy. And the battles far away sometimes come right here to our soil, as the unprovoked and brutal attack in San Bernardino so clearly showed us. What occurs daily in so many different parts of the world could occur here. That is why we have to be prepared and vigilant. I wish it were not the case but it is. Here at the state Capitol we often think we have more control over things than we actually do. But the truth is that global events, markets and policies set the pace and shape the world we live in. The challenge is to solve today’s problems without making those of tomorrow even worse. We face a future that is partly determined and yet in many ways unknown. Our job is to clearly face the facts we do know and prepare for the many unknowns as best we can. In that spirit, you are not going to hear me talk today about new programs. Rather, I am going to focus on how we pay for the commitments we have already made. Let’s start with the budget. What we do know is that since the Second World War, we have experienced 10 recessions, none of them expected or accurately predicted. Economists are unable to pinpoint when a recession will begin or how long it will last. 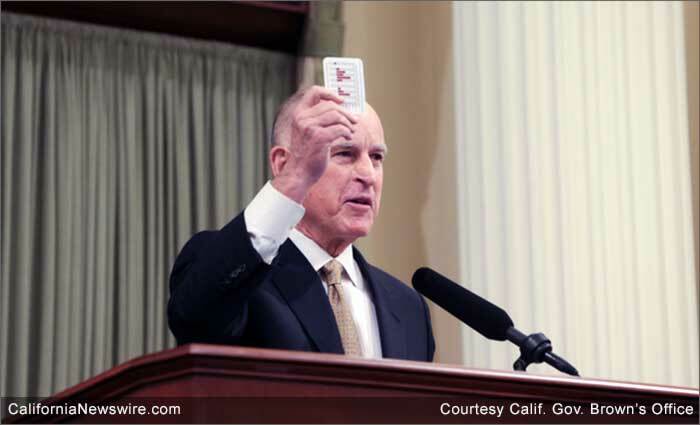 Historically, California budgets have been built around forecasts that assume uninterrupted growth. Just looking at the last two recessions, we notice that ongoing state spending accelerated right into the downturn. That is why if you add up the deficits and surpluses between 2000 and 2016, you find that the total deficits were seven times as large as the surpluses, resulting in painful and unplanned-for cuts. Schools, child care, courts, social services and other vital state programs were deeply affected. So too were our universities which had to reduce classes and double tuition. I don’t want to make those mistakes again. According to economists at the Department of Finance, the next recession, even if it were only of average intensity, would cut our revenues by $55 billion over three years. That is why it is imperative to build up the Rainy Day Fund – which was recently overwhelmingly approved by the voters – and invest our temporary surpluses in badly needed infrastructure or in other ways that will not lock in future spending. We must also be realistic about our current tax system. California has a very progressive but volatile income tax that provides 70 percent of General Fund revenues. If we are to minimize the zigzag of spend-cut-spend that this tax system inevitably produces, we must build a very large reserve. We also know that inequality has risen sharply in recent decades. We have seen the disappearance of many middle class jobs and the growing share of income taken by the top 1 percent and even more so by the top .01 percent. In fact, the proportion of income earned by the 1 percent has almost tripled. This contrasts sharply with the virtual stagnation in the wages of so many ordinary Americans. And CEO pay has risen from 22 times the average worker pay to 352 times. Such inequality is reinforced by national regulatory and tax policies and driven by globalization and the relentless influx of cheaper goods and outsourcing of higher-paying jobs. Technological change also plays its part through sophisticated software, robotics and global communication. Of course this creates jobs, keeps inflation low and makes available phenomenal amounts of information and undreamed of conveniences. But it also makes for higher pay at the top and a huge number of low-paying service jobs below. –	In May, we will start providing full health care coverage to the children of undocumented workers. Most importantly – and this is truly monumental – we have wholeheartedly embraced the Affordable Care Act. As a result, we are now enrolling 13.5 million Californians in Medi-Cal and another 1.5 million in Covered California. This is an historic achievement. It will provide health security to so many who could not otherwise afford it. Another area where we are leading the nation is how we provide health services to people in their own homes and, in the process, give jobs to their providers. Over the past two years, we have expanded this In-Home Supportive Services program by serving more recipients, giving current recipients more hours of care and by giving – for the first time – overtime pay to those workers who provide the services. While the benefits of these programs are enormous, so too are the costs – both now and into the future. In four years, total Medi-Cal costs have grown by $23 billion. As the state begins to pay for its share of the millions of new enrollees, the cost to the General Fund will also rise. In 2012, the General Fund paid $15 billion for Medi-Cal, but by 2019, that number is expected to be $25 billion, an increase of two-thirds. For In-Home Supportive Services, in just two years, total spending will jump by $2 billion – to $9.2 billion – a 28 percent increase. As the economic recovery reaches its end point and turns downward, it is crucial that we honestly face and plan for these increased costs. In this regard, I ask you – Republicans and Democrats alike – to seriously consider the newly revised MCO financing reform. Other states have taken advantage of this federal program and California should not shortchange itself. This is not a tax increase, no matter what anyone tells you. The arithmetic is simple: California comes out a clear winner. With respect to education, the strong economic recovery and the passage of Proposition 30 has allowed us to increase spending on public schools and community colleges from a low of $47.3 billion in 2011, to $71.6 billion this budget year. That is a 51 percent increase in overall spending, with significant sums allocated under the Local Control Formula to provide for the unique challenges that face low-income students, English learners and those in foster care. This pattern of educational spending reverses the historic practice of assuming that all students encounter similar circumstances. They do not. The Local Control Formula, now in its fourth year, recognizes this fact with extra funding to enable educators to overcome the barriers that confront non-English speaking families and those with low and very modest incomes. I am proud of how California has led the country in the way it is returning control to local school districts. For the last two decades, there has been a national movement to micromanage teachers from afar, through increasingly minute and prescriptive state and federal regulations. California successfully fought that movement and has now changed its overly intrusive, test-heavy state control to a true system of local accountability. We also know that the state has made other commitments – ones that we have yet to fully pay for. Our retirement liabilities – for pensions and lifelong health benefits for state and university workers – total $220 billion. Each year, the budget must allocate billions to slowly chip away at these obligations. Since 2012, we have taken steps to reduce the future costs of these pensions and put the teachers’ system back on solid fiscal footing. Still, we have more work to do. To date, we have set aside only a token amount to pay for $72 billion in future retiree health benefits. These liabilities are so massive that it is tempting to ignore them. We can’t possibly pay them off in a year or two or even 10. And there is little satisfaction in the notion of chipping away at an obligation for three decades to pay for something that has already been promised. Yet, it is our moral obligation to do so – particularly before we make new commitments. We have promised our workers these benefits in exchange for careers spent serving the public. If we fail to acknowledge and pay for these obligations, we will unfairly burden future generations of Californians with these debts. Another long-term obligation we have to face is our deteriorating infrastructure. From state office buildings here in Sacramento to levees and facilities in our parks, universities, prisons and state hospitals – serious deficiencies abound. In this year’s budget, I am proposing that we use $2 billion of our temporary surplus on one-time investments to repair and replace aging structures. Neglecting what we have built over many years and letting it further deteriorate makes no sense and will just pile up costs in the long run. But that is not all. Our overall state deferred maintenance is staggering, estimated to total $77 billion. Most of that is in our roads, highways and bridges. Here is our challenge: We have no choice but to maintain our transportation infrastructure. Yet, doing so without an expanded and permanent revenue source is impossible. That means at some point, sooner rather than later, we have to bite the bullet and enact new fees and taxes for this purpose. Ideology and politics stand in the way, but one way or another the roads must be fixed. One of the bright spots in our contentious politics is the joining together of both parties and the people themselves to secure passage of Proposition 1, the Water Bond. That, together with our California Water Action Plan, establishes a solid program to deal with the drought and the longer-term challenge of using our water wisely. Our goal must be to preserve California’s natural beauty and ensure a vibrant economy – on our farms, in our cities and for all the people who live here. There is no magic bullet but a series of actions must be taken. We have to recharge our aquifers, manage the groundwater, recycle, capture stormwater, build storage and reliable conveyance, improve efficiency everywhere, invest in new technologies – including desalination – and all the while recognize that there are some limits. Besides the immediacy of the drought, there is the overarching threat of a warming climate. Incredibly – though last year was the hottest on record – there are still those, particularly in Washington, who are in denial. But even the deniers can’t deny the carbon pollution that exists all over the world. It is causing serious injury and respiratory disease to people of all ages, but especially the young and very old. Thankfully the rest of the world has heard the message: Humankind must change its ways and radically decarbonize the economy. The Paris climate agreement was a breakthrough and California was there leading the way. Over 100 states, provinces and regions have now signed on to our Under 2 MOU. The goal is to bring per capita greenhouse gases down to two tons per person. This will take decades and vast innovation. But with SB 350, we’re on our way. Finally, we know that in life, disasters happen. Fires, floods, earthquakes – they will occur and we must be prepared to respond. That too – by the way – requires that we save and maintain a solid reserve. This morning I have talked a lot about the difficulties that lie ahead, but let’s not forget how far we have come. In 2011, the state deficit was $27 billion, our credit rating was the worst in the nation and unemployment was 12 percent. –	Two million new jobs have been created and unemployment has dropped in half. Yes, it is clear that California is still The Great Exception. We dare to do what others only dream of. Difficulties remain, as they always will. That is the human condition. And finding the right path forward is formidable. But find it we will, as we have in the past and as we will again – with courage and confidence.